Abducted Cow társasjáték - Magyarország társasjáték keresője! A társasjáték érték! Az Abducted Cow egy kiváló társasjáték, 2 - 5 játékos részére, az átlagos játékidő rövid, csak 10 - 30 perc. A társast, 13 éves kortól ajánljuk kipróbálni. A játékmenet erősen épít a vedd el mechanizmusra. 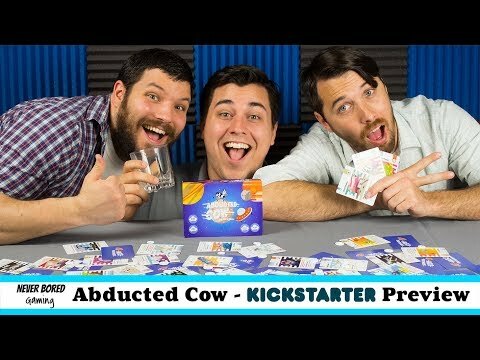 Abducted Cow is a 2-5 player tactical sci-fi card game. You play the role of the alien controlling a UFO. Coming to earth you develop an unhealthy fascination for the creatures we call cows. It is a race with your opponents to fill your ship with these animals. To win, you attack, defend and steal the cows of your opponents. The card draw pile is composed of 4 categories of card: attack, steal, defend and utility. Attack cards kill cows; defend cards defend your cows; steal cards steal the cows of your opponents; and utility cards influence gameplay. You draw to a limit of 3 cards at the start of your turn. In addition, you take one cow token and one energy token from the main supply. Each card has an energy cost associated with it, with more powerful cards costing more energy. Energy may also be acquired through utility cards, discarding a single card at the end of your turn or discarding 2 cards during. The winner is the player who acquires 10 cows, or the most cows once the card draw pile is depleted.